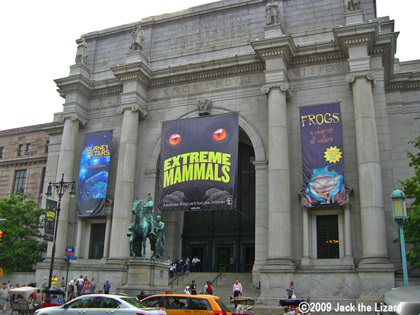 40 years ago, AMNH has started its history. The collection is one of the finest and largest in the world. This time we visited the Dinosaur Hall. 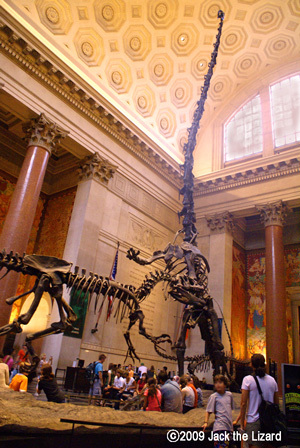 Barosaurus and Allosaurus welcome visitors in the Theodore Roosevelt rotunda. Tyrannosaurus suddenly appeared. The exhibitions are not arranged in order of time. You may be confused. 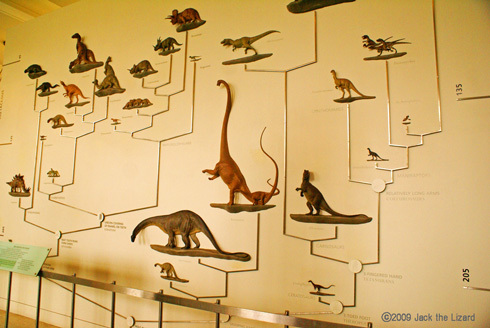 However at the fossil hall physically similar animals are grouped together in the tree of life. The display is according to those groups. It is exciting to see a resemblance between birds and dinosaurs. 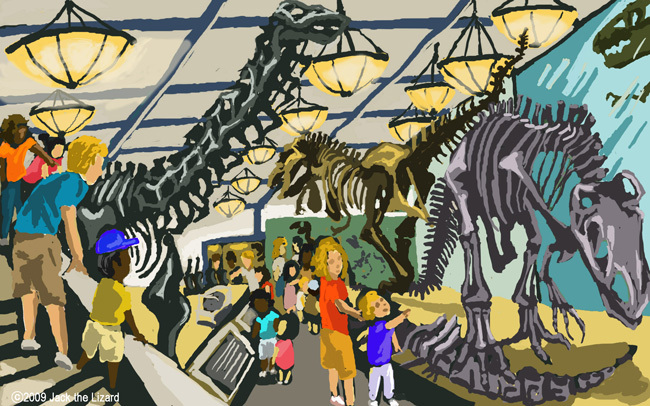 You can observe the whole skeleton of Apatosaurus both from above and below. The fossil that you cannot miss is this. 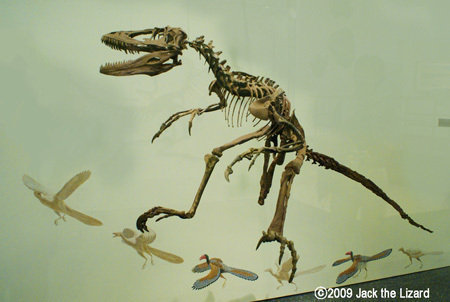 This is the only real fossil Deinonychus on display in the world. Deinonychus is one of the famous non-avian maniraptor. 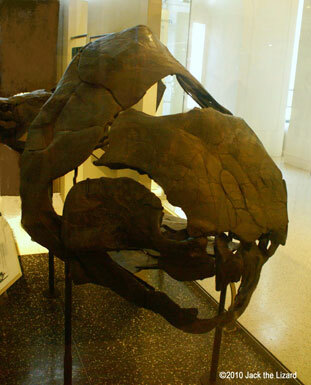 Maniraptora is the group of dinosaurs which is closely related to birds. The structure of wrists and shoulders suggests that the bird is a kind of dinosaurs. This skeleton of Struthiomius is almost complete specimen. Only tip of the tail and fragment of the skull are missing. You might notice that the neck of some dinosaur fossils curves always backward. Since the strong ligaments of the neck pull the heads back after they died, this is a typical death pose of theropod dinosaurs. Modern birds are also like this position. It is rare to see real Tyrannosaurus rex skeleton in public. This is the one. 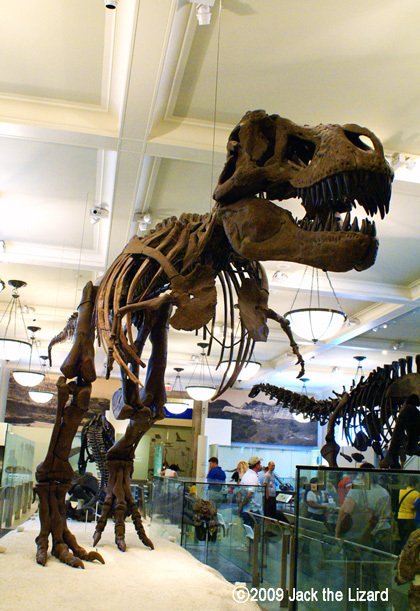 In fact more than 80% of the fossil specimens on display in AMNH are real. 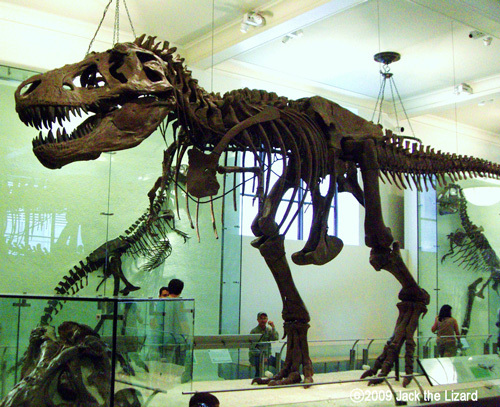 T.rex is one of the most famous dinosaurs, but only 15 incomplete skeletons have been acquired. This T.rex skull was collected by master dinosaur hunter Barnum Brown in central Montana, 1908. This specimen is not only complete but also very good condition. 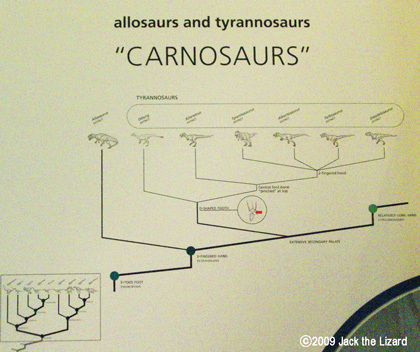 The group of Carnosaurs includes the large carnivorous dinosaurs during the Jurassic and Cretaceous periods. 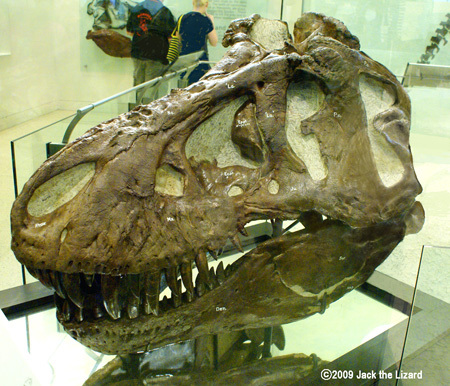 Both Allosaurus and Tyrannosaurus are in this group, but Allosaurus branched off because it had three fingered hand. On the other hand D-shaped tooth is the character of Tyrannosaurus. Coelophysis is one of the oldest dinosaurs in the group of ceratosaurs. They lived during late Traissic period, about 220 million years ago. 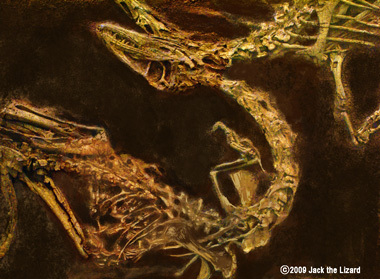 Several hundreds of specimens of Coelophysis have been discovered in Ghost Ranch, New Mexico. They might have been victims of a flash flood. 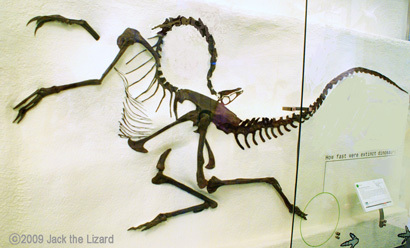 One specimen of Coelophysis has the bones of primitive crocodiles inside. This egg has been found in southern France. Hypselosaurus was commonly excavated in this area. From this circumstance this egg might belong to Hypselosaurus, but that is not for sure. It is very difficult to tell who the mother of a particular egg is. One of the reason is that dinosaur baby rarely remained inside of the egg. This part shows some ancient fishes. Although most of them are extinct now, their remains show us how fish diversify their families. 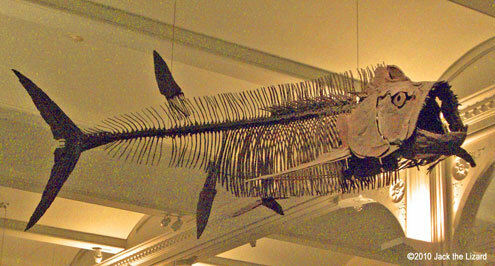 Xiphactinus is the bony predatory fish lived during the Late Cretaceous period. Unfortunately Xiphactinus and its relatives are most likely extinct now, but the group called teleostei to which Xiphactinus belongs is still thriving. In fact majority of living fish today are in this group. By the way the teleostei is member of the ray-finned fishes. The key points of evolution in the ray-finned fishes are transformations in jaws, fins and tails. 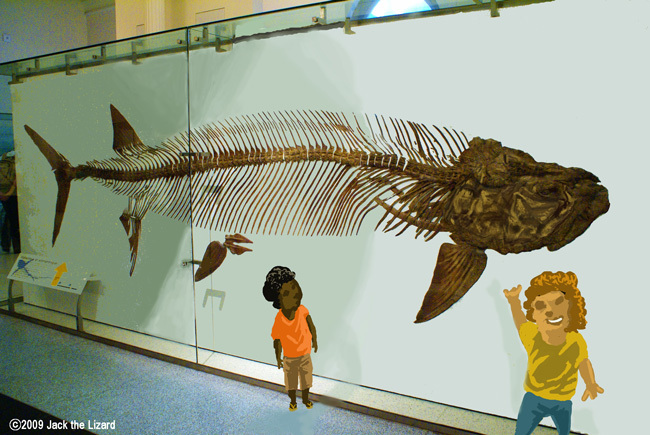 Dunkleosteus was the apex predator fish, lived during the Late Devonian period. 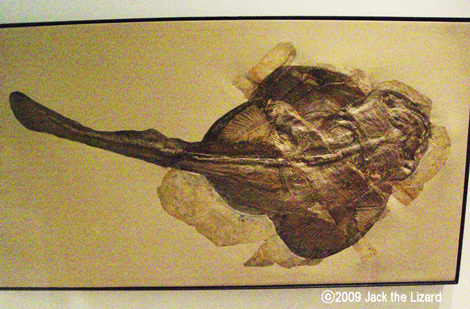 Placoderms are the ancient extinct fishes and Dunkleosteus is one of them. The features of Placoderms are heavy armors covering the head and trunk. 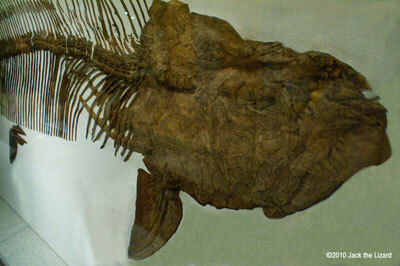 They are also the earliest fishes have developed jaws. Pseudorhina is related to modern angel sharks Squatinoids. Pseudorhina lived about 150 million years ago during the Late Jurassic period. The fossil was discovered in Germany. Although most characteristic features of rays are missing, Squatinoids are ancestors of the rays. Varieties of ancient reptiles are on display in this section. Some of them lived on the land and others adapted their bodies to the sea. Tortoises are terrestrial turtles, found in all continents except Antarctica and Australia. They are the newest group in the turtle evolution. Their bodies adapted to dry area and can get enough water from plants which are their primary food. 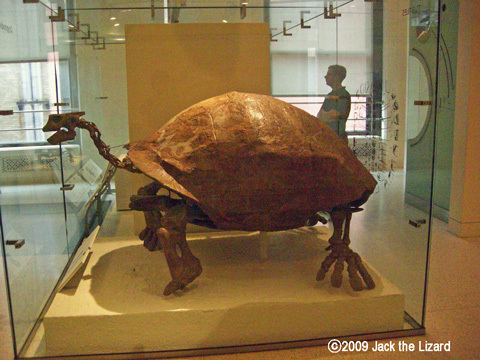 Some species of tortoises grow up very large, such as Aldabra Giant tortoise and Galapagos tortoise. 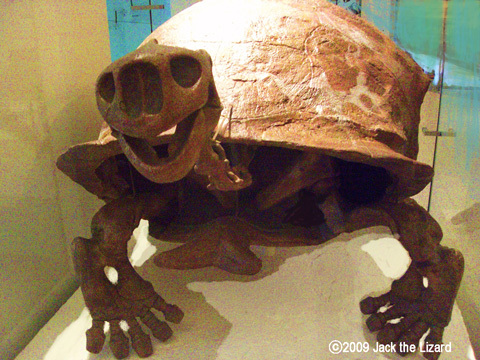 Geochelone atlas lived 2 million years ago during the Late Pliocene. The fossils were found in India. 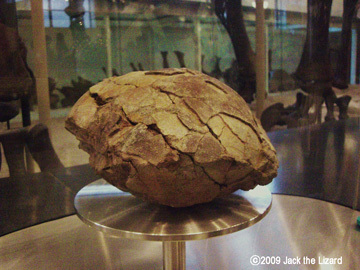 The reason why Geochelone atlas grew up very large size is still unknown. 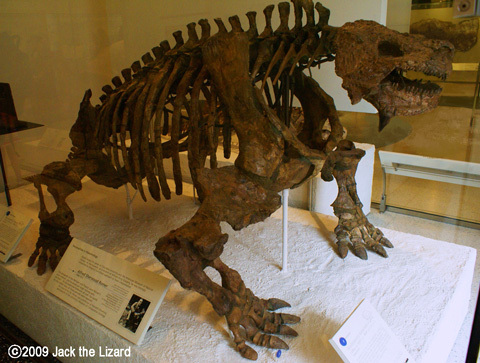 Scutosaurus lived about 253 million years ago during the Late Permian period. 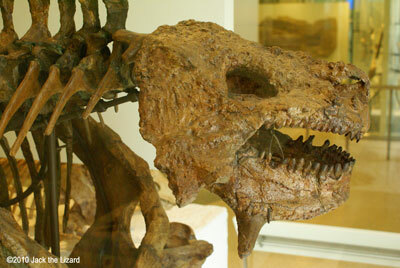 Scutosaurus is a member of the Pareiasaurs family of which features are spikes on the jaws and wart around head. The teeth adapted to eat the plants. The fossils of Pareiasaurs have been discovered throughout the world such as Africa, Europe and Asia. 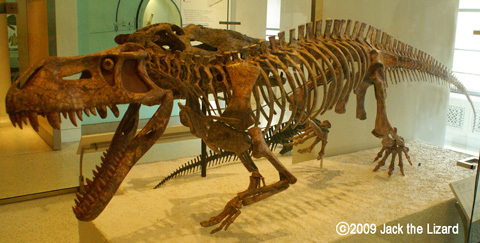 This Scutosaurus was found in Russia. Pretosuchus is closely related to crocodylomorphs that include crocodilians. 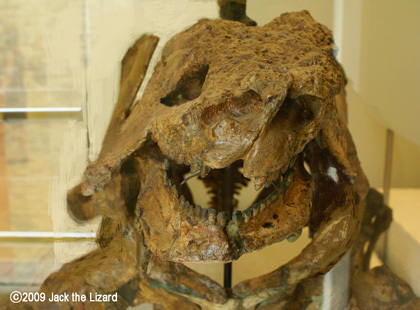 Pretosuchus lived during the Late Triassic period about 210 million years ago. 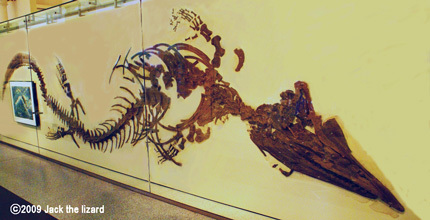 This skeleton is the cast but original fossils are from Brazil. Tylosaurus is a member of the Mosasaurus family. Mosasaurus were the group of marine lizards that lived during the Late Cretaceous period. The diets of Mosasaurus were fishes and other marine animals. Tylosaurus lived during the Late Cretaceous period about 85 years ago. Xiphactinus and flying carnivorous lizard Pteranodon were also lived same period of time. The fossil is from Kansas, U.S.A.
Cryptocleidus is one of the Plesiosaurs, a group of marine reptiles that lived from the late Triassic to the end of the Cretaceous. Plesiosaurus had well-developed muscles around shoulders and pelvic. Those muscles were useful for swimming. Cryptocleidus is a short-necked Plesiosaurs that lived during the Late Jurassic period about 150 million years ago. The fossils were collected in England.